Laura Gannon works across a range of media: painting, drawing, sculpture and video. With a background in film, she has often installed her video work using dividing elements, screens or benches, to create selective viewing experiences for her audience. The artist has recently developed a series of paintings using metallic ink on unstretched linen. At the end of the painting process, the artist cuts into the linen. While cutting gestures inevitably make reference to the work of Lucio Fontana, Gannon’s interests are different. Fontana was interested in breaking the picture plane, the cuts in his work created dark mysterious slits. Gannon, by contrast, seeks to admit light and thus incorporating the wall into the work itself. 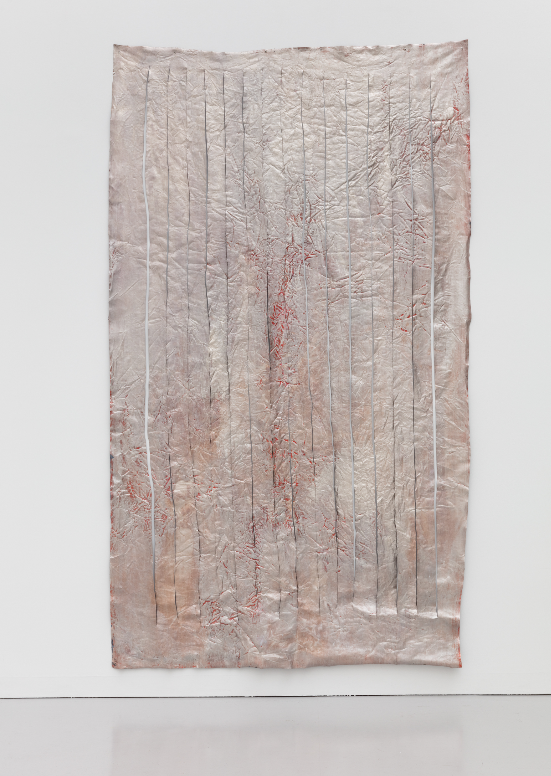 Her work has a strong relation to the body, whether through the gesture of cutting or its impression of capillaries. Gannon’s practice can be understood as the meeting point of the performative and the sculptural.